Heartwood can range from a lighter pale brown to a dark chocolate brown with darker brown streaks. Color can sometimes have a gray, purple, or reddish cast. Sapwood is nearly white. 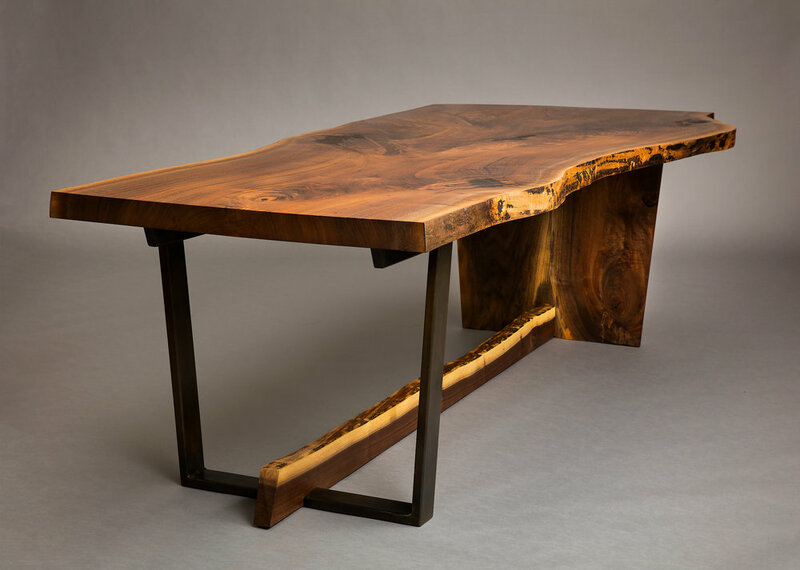 Wood from orchard trees that have been grafted with English Walnut may have a colorful/streaked appearance near the graft, which is sometimes referred to as “marbled Claro Walnut.” Claro Walnut can occasionally also be found with figured grain patterns such as: curly, crotch, and burl (source). Grain is usually straight, but can be irregular. Has a medium texture and moderate natural luster. End grain is semi-ring-porous; large earlywood pores grading to medium latewood pores, few; solitary and radial multiples of 2-3; tyloses occasionally to abundantly present; growth rings distinct; rays barely visible without lens; parenchyma banded (marginal), apotracheal parenchyma diffuse-in-aggregates (sometimes very faint and barely visible even with lens). Source. Walnut is one of our most favorite woods to work with. The grain patterns and styles are amazing. See for yourself here or stop by our shop. Visit our shop to learn more about claro walnut.